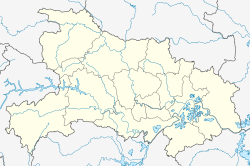 Zhushan County (simplified Chinese: 竹山县; traditional Chinese: 竹山縣; pinyin: Zhúshān Xiàn) is a county of northwestern Hubei province, People's Republic of China, bordering Shaanxi province to the north and Chongqing municipality in the far south. It is under the administration of Shiyan and has a total population of 440,000[when?] residing in an area of 3,590 square kilometres (1,390 sq mi).